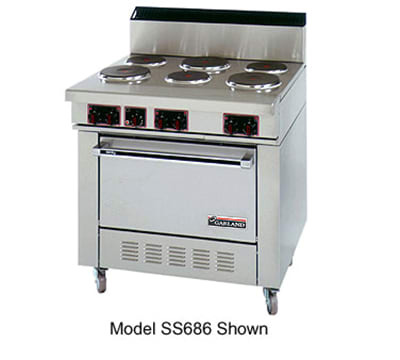 The Garland S686 medium-duty range has a stainless steel exterior for durability and a porcelain interior finish. The cool-touch oven door handles prevent burns, and a removable oven rack can be placed in 4 different positions with the rack guides. On the cooktop, six tubular heating elements each have their own control knob. To contain messes, the Garland S686 medium-duty range has a 10-inch-tall backsplash on the rear. Visit our commercial range article to see which unit is right for you.